The Fibers and Fabrics Course covers fibers sources through fabric preparation and general processing—including fabric construction, identification and color dyes and design. The Wetcleaning Course reviews the steps in the wetcleaning process—inspection, testing for colorfastness, stain removal, load classification and proper drying including wet cleaning chemistry as well as equipment and supplies. The Stain Removal Techniques Self Study Course is scheduled to be moved online later this year. Five more Self Study Courses will also be added as the program continues. This fundamental course discusses stain removal techniques and procedures, stain composition, precautions and troubleshooting. DLI’s introduced its Self Study Courses in 1954 when DLI (then the National Institue of Drycleaning or NID) mailed its first Spotting Correspondence Course. An examination accompanies each online lesson or study guide. Students formally took a paper examination and mailed it back to the Institute for scoring. Posting the exams online reduces the amount of time involved to provide better, faster service. Results are displayed instatntly at the end of the exam, eliminating a several week wait for students to learn about their scores. The courses are ideal for cleaning owners or employees who wish to learn but do not have time to study at DLI’s School of Drycleaning Technology. They are also make it easier for international or distant cleaners to learn and improve their skills. 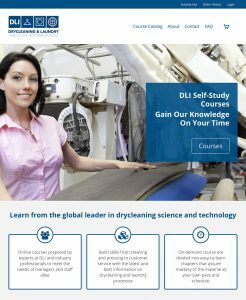 In keeping with DLI’s commitment to education, all DLI School of Drycleaning Technology Resident Courses, online Self Study Courses, and Certifications are available to all drycleaners worldwide. The online Self Study Courses are available for $139.